Hail wise one. Are you ready to master a vibrant new world of swords and sorcery drawn from a tapestry of ancient legends and feverish nightmare. That power is now yours. The untamed lands are your canvas for painting unlimited tales of high adventure, glory and woe. Spin wicked webs to ensnare unsuspecting characters in battle lust, poison and plot. Craft challenges to exalt great heroes or crush them before you to the lamentations of the players. You have all the tools you will need right here at your fingertips. with this tome you will discover what epic tales you may temper in the fires of imagination. A GM's introduction to the setting. Numerous campaign models detailing many possible roads to adventure in the untamed lands. A Sword and sorcery themed adventure generator. Savage tales of adventure set in each of the major regions of the untamed lands. Countless hordes of beasts, native spirits and nameless horrors. NPCs from loyal sidekicks to vile sorcerers. Traps, Poisons and other dangers. Lists inspirational reading and viewing material to fuel your imagination. 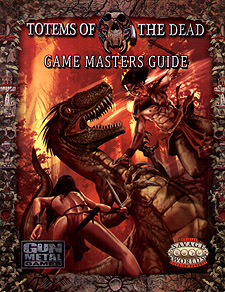 Meant for use with the Savage Worlds Roleplaying Game and the Totems of The Dead Players Guide. The Savage Worlds RPG is arguably one of the best systems for running classic swords and sorcery tales in the mode of Robert E. Howard's Conan the barbarian. It is good to see a number of settings come on to the market in the last couple of years that emulate the look and feel of the Conan tales. Totems of the Dead (TOTD) is not only one of the most original, it is also one of the best. The setting is split over two books. The Player's Guide and the GM's Guide and both are needed to play (along with the Savage Worlds core rules). The author of TOTD is Matthew Kaiser, a freelance writer who worked previously on True20 products for Green Ronin and also the Conan RPG for Mongoose Publishing. The latter link is important here. Towards the end of their Conan Licence, Mongoose Publishing tried to use their excellent source material with other RPG systems (the original Conan RPG worked with D&D 3rd edition and 3.5) and proposed conversions to both RuneQuest and Savage Worlds. Unfortunately for whatever reason these new source books never came out but Matthew Kaiser was involved in writing the Savage Worlds conversion. Now TOTD is not a Conan clone. Far from it. The tales of Robert Howard's barbarian took place in the mythical land of Hyboria, and drew heavily on the historical settings and cultures of Europe, the Middle East, India, and China. Matthew Kaiser weaves a similar magic over the North American continent, breathing life into a land based on Native American mythology. You have a fantastic canvas on which to base your own tales. Explore the harsh northern lands of mythical Canada as a pioneering Viking settler? Check. Fight against the brutal harsh blood magic of Aztecs? Check. Deal with the sorcerer kings from Atlantis? Check. And then there is the brooding malevolence of the spirit world from Native American mythology? Check. All this and more is effortlessly integrated into the Savage Worlds system. In this GM book you get a host of new animals, spirits and monsters to throw at your players. While many have origins in the Conan tales (there is more than a passing resemblance between the Frost Giant Seductress and Atali the Frost Giants's Daughter from the Conan tale of the same name), there are many unique creations based on Norse, Aztec, and Native American mythology. Combined with a varied selection of Savage Tales to get you started, this is an excellent canvas for any GM. The book itself is softcover, 140 pages, with a full colour cover and black and white interior. The interior art is much more variable in quality compared to the Player's Guide and not all creatures are illustrated. However, the two books together make a compelling campaign setting and is highly recommended!